Posted by Ian Sigalow on March 25th, 2016 . For one reason or another, many good companies have a hard time gaining traction with investors—their meetings fall flat, their messages go unanswered, or they get the “Let’s check back in a few quarters” routine. Of course, some of this is simply out of an entrepreneur’s control. Public stock prices are down, the IPO market has cooled off, and M&A is as fickle as March weather in New York City. So the bar is high for entrepreneurs right now. That said, there are definitely common mistakes that people make in fundraising. I’ve come up with the following pitfalls—for fun I called them the “Seven Deadly Sins”—that seem to be, well, deadly, when it comes to attracting capital. Steer clear of these and you’ll stand above the rest. Investors want companies that have the potential to be big. No, scratch that, investors want companies that can be huge. Just five years ago, a company with $100 million in annual revenue could go public. Not anymore. Pundits criticize Etsy for going public too early. Meanwhile they have been around for 10 years and have $250 million of annual revenues. We see far too many companies whose only exit prospect is a tuck-in acquisition because their respective market caps out at $100 million of annual revenue. If your plan does not have IPO-sized ambitions, even under a cascade-of-miracles scenario, VCs are most likely not interested in talking with you. 2) Putting lipstick on the pig. VCs make pretty good lie detectors. All too often, entrepreneurs, for whatever reason, feel the need to exaggerate their story. Inevitably they sound like Donald Trump at an NRA rally. Ever hear an entrepreneur say, “We are very very well positioned and nobody can compete with us”? Bottom line: partner meetings are not a good time to use hyperbole. If you sound like a certain orange-faced politician you won’t get far. There is a place for coddling and on-the-job-training, but it’s not the pitch meeting. We want you to inspire confidence that you will make the right decisions, particularly when we aren’t looking. Expertise is good, but even better is a track record of achievement. When pressed, almost all VCs say that the management team is more important than the business idea. 4) Bringing the clown car to the meeting. 5) Don’t have “dad” do all the talking. If your chairman or banker leads the meeting, that is like bringing dad to school to give your presentation. In our experience, effective leaders don’t let other people talk over them. If that turns out to be the case in our meeting, you will get a pass from us. 6) Making life too complicated. Mark Twain once quipped, “I’m sorry I sent you a long letter, but I didn’t have time to write a short one.” Take the time to write a short presentation. No more than 20 slides. No more than 30 minutes of talking. Practice until you get there. And if you need to cut, get rid of the market slides. VCs read thousands of business plans a year, so you don’t have to tell me your market is big. The sole exception is a single, counter-intuitive statistic that blows your mind – for instance did you know that Costco swiped more American Express cards in 2014 than all of Europe? 7) Failing to do your homework. Good entrepreneurs research VCs before the meeting: How big is the fund? Who else did she invest in? Who is coming to the meeting? What contacts do we have in common? We are on LinkedIn, Twitter, and Facebook and your ability to mine that data is an IQ test. One easy tip: the size of a firm’s fund dictates the size of the check they write. (Hint: Big funds = big checks, small funds… you get the point.) If you’re looking for $25 million, target people with growth funds. 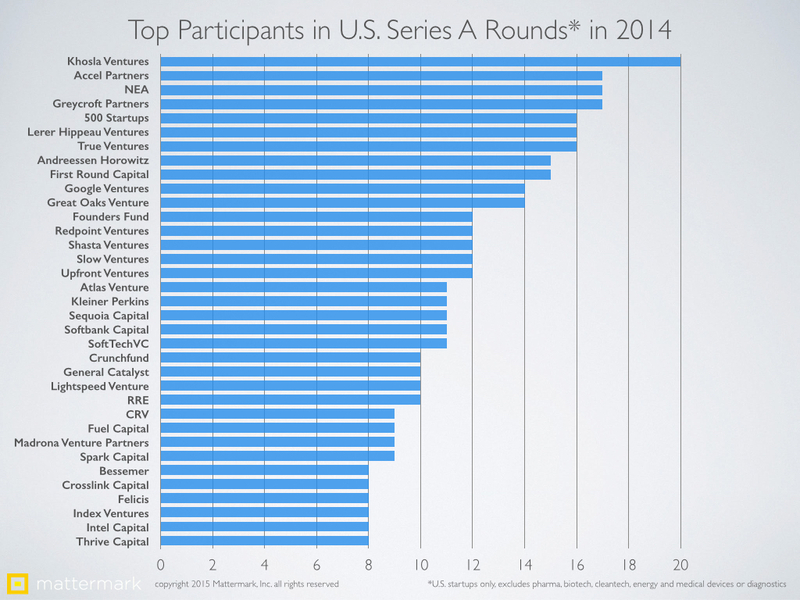 If you want $1-5 million, look at the Series A league tables on Mattermark. They keep good statistics even if they occasionally mess up alphabetical order. Last, but certainly not least, keep in mind that VCs talk. Not only do we talk about March Madness, the sexcapades of famous VCs, and guest appearances on HBO’s Silicon Valley, but we also talk about companies we’ve met with. When we’re excited about a new company you can bet the word will get out. But guess what? If we’re less than impressed, that eventually gets out, too. Posted on 2:47 am April 14, 2017. Definitely a great read. Always nice when the info comes from the “inside”.